An Israeli border policeman who murdered a 16-year-old Palestinian teen on Nakba Day, four years ago, was sentenced to only nine months in prison, on Wednesday. The Jerusalem District Court sentenced Israeli border policeman Ben Deri to nine months in prison, after being convicted of negligent homicide, upon killing Nadim Nuwara in Ramallah, four years ago. 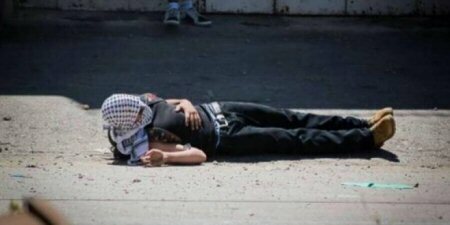 Nuwara and another Palestinian teenager, Mohammad Abu Daher, 17, were deliberately shot dead during a protest commemorating the anniversary of the Nakba on May 15, 2014, in Beitunia town, near Ramallah. Neither one had posed any threat to Israeli forces in the area. Under a plea deal, Deri was fined 50,000 shekels (approximately $14,000) in compensation for Nuwara’s death and would only serve seven months in prison, as the sentence includes time served. Earlier this year, Ben Deri was cleared of the charge of manslaughter and convicted, instead, of negligent homicide. According to WAFA, he admitted to firing at Nuwara’s chest, but claimed he did not realize it was live ammunition, as opposed to a rubber-coated steel bullet. He has called for an international probe into the killing of his son.